They came!!! 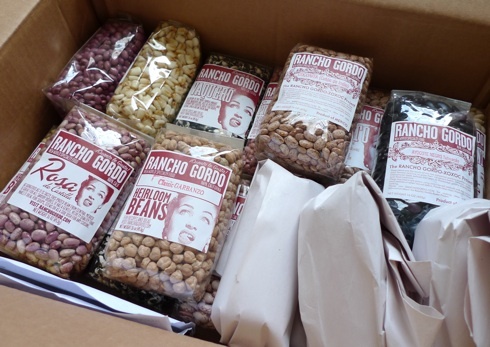 A box full of Rancho Gordo beans in many colors and shapes and sizes! Think of the possibilities! I’m getting so hungry! I ordered these as a reward for some hard work in the “personal wellness department” – nothing like rewarding yourself with something healthy, tasty and delicious. They also make great unique gifts. When I posted my bean soup a few days ago, I actually got private emails from people confiding that they had no idea what to do with beans, and asking what I did with them other than the spicy bean soup and chili. For me, beans are pretty much a daily food, and I’m almost never eating the same bean dish twice! At the beginning of the week, I like to cook a batch of dried beans. Canned beans are fine (I tend to have a few cans of organic beans in the pantry for emergencies) but dried beans are so much better – particularly organic and heirloom varieties – they just taste better and have more texture. They also have much lower levels of sodium, which is added to the cans as preservatives – so if you do use canned beans, make sure to give them a rinse before cooking. I like to buy my dried beans from Rainbow in San Francisco, Phipps Country Store, or from bulk bins in a store that has large turnover to ensure freshness. Heirloom beans from Rancho Gordo are great because they are less than a year old, and the fresher the bean – the more nutrients, the better the taste and the quicker the cooking time. All it takes is a soak over night and a few hours in some boiling water – it’s mostly hands off. They are also perfect for slow cookers, so theoretically you wouldn’t even have to be at home while they cook. For those of you concerned about the, erm.. “Musical Quality” of beans – there are a few things that you can do – try boiling your beans with a strip of Kombu (kelp – from which the taste Umami was discovered), or the Mexican herb Epazote, both of which help break down certain chemical compounds in the beans and reduce the post-bean-consumption concerts. I like to alternate different beans each week for variety. My current favorites are Borlotti beans (cranberry beans), garbanzos (chick peas), and Christmas Limas, but I’m always out on the hunt for new varietals that I haven’t tasted. After cooking my batch at the beginning of the week, I add the cooked beans to soups, salads, mash them on sandwiches, throw into omelets, mix with salsa and top with some cheese, or dress them with a vinaigrette. I also like tossing them with roasted vegetables, making chili, and eating them with dark leafy greens such as collards, kale, or chard. 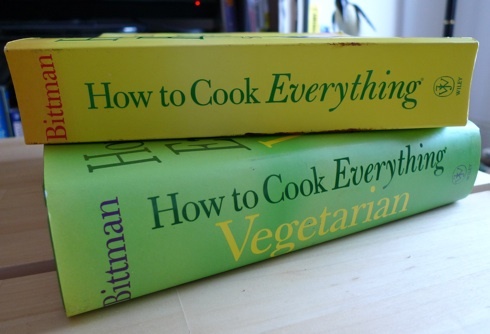 I get a lot of great ideas from Mark Bittman’s Books – How to Cook Everything and How to Cook Everything Vegetarian. And from the cookbook “Heirloom Beans” by Steve Sando of Rancho Gordo, and Vanessa Barrington. Another trick I use to make beans (or anything else for that matter) interesting is my “pick an ethnic cuisine, and use the right flavors from the condiment collection to flavor the food in that way.” Every culture has recipes for beans, and it’s fun to experience a global bean perspective. This is where having a good pantry comes in handy. For instance, I might decide that I want my beans to taste Moroccan – so I might pick lima beans, and flavor them with cumin, cinnamon, and pepper, and serve it over cous cous. Or I might want to go Indian, and choose kidney beans and lentils with curry powder and garam masala. Mexican? Maybe saute some onion and red pepper, and add black beans with oregano and mexican red chile. It’s not a perfect science, or perfectly authentic, but it’s a great way to mix things up and keep the taste buds excited. When in doubt, I crack out some of my great regional cookbooks, or look on the blogs for new ideas. I recently made Red Beans and Rice, adapted from John Besh’s really fantastic My New Orleans Cookbook (ok, I didn’t have ham hocks but I used andouille sausage). Elise from simply recipes also has a great recipe for red beans and rice. I also love making Turkish dishes like Kuru Fasulye, simmered white beans and meat, (a good recipe from Zerrin’s blog), or Barbunya Pilaki – a cold bean salad in olive oil, like this one from Almost Turkish recipes. Or, you can go for the baked beans route – not totally traditional, but I happen to really like Heidi Swanson’s Beer Baked Beans. 1. Make your own hummus – mash cooked garbanzo beans (chickpeas) with a spoonful of tahini, lemon juice, olive oil, and salt. You could also do it with cooked white beans, and bonus points if you top it with some pine nuts, a dusting of cumin, and fresh mint or parsley. 2. Refried beans – works great with cooked pinto beans or black beans – heat some oil/lard/or butter in a skillet, saute some onion (optional), and add mash your beans into it with a little bit of water. Cook until everything is warm, and season with a little salt, and maybe some cheddar or tapatio sauce if you have it. Top maybe with salsa and guacamole if you want, and eat with a warm tortilla. 3. Beans and a fried Egg – top plain beans, refried beans, bean soup, bean mash, you name it – with a fried egg. Poke egg, and stir into beans, and it’s just plain delicious. Although, frankly you top a good, organic, pastured egg on pretty much anything and it’s delicious. 4. Beans and Pasta – you could add cooked cannelini (white beans) or borlotti (cranberry) beans to your spaghetti and red sauce, or toss them with garlic and olive oil with some short pastas like campanelle or penne and top with a good dusting of black pepper and Parmesan. 5. Beans as a side dish – one of my favorite preparations of really any bean is simply tossed in a simple vinaigrette. This works best when the beans are still warm from cooking, but after tossing you can whack it in the fridge until about 20 minutes before you are ready to eat, at which point you take them out and let them get to room temperature. You can add freshly chopped vegetables such as tomatoes, cucumber, red bell peppers, and trim in fresh herbs like parsley and mint, and add in some salty cheese such as feta, or even hard cheeses like an aged parmesan. Seriously folks, the possibilities are limitless. Just get a pound of beans and go for it. I do love beans a lot and often make Kuru Fasulye or Pilaki or piyaz (cold bean salad with onions, tomatoes, parsley, olive oil, and lemon). But have never tried to make hummus from beans and the other dishes you listed above. It looks like a great round up! And thank you for giving a link to my Beans with Meat. <3 <3 Rancho Gordo. I often trek over to the Ferry Building Market just for beans. .-= Stephanie – Wasabimon´s last blog ..Holiday Foodie Gifts for $20 or under =-. Hi Sam — We met briefly at the BlogHer party last week. I remembered your blog name from your name tag and I’ve finally had a chance to chase it down to check it out. I’ve happily spent the last hour or so reading through your older posts. I love your suggestions for beans. My husband and I have been trying to cut some of the meat from our diets and though I know beans are a great way to do it, I never seem to take the time to just cook some. You’ve definitely inspired me to break out the Crock Pot and get a batch going! .-= Wendy´s last blog ..The Week in Bentos: November 30 – December 4, 2009 =-. Wow, thanks for the great ideas. I love beans for their high protein factor but tire of my usual recipes. And I’ve yet to make my own hummus but would like to try. Totally love it! I have a recipe on my site for Borracho beans – otherwise known as drunk beans. Pintos, beer, bacon, garlic and cilantro (with a little chicken broth too). Talk about an amazing meal. YUM. .-= Amber´s last blog ..Angie’s Famous Meatballs =-. Thank you everyone! 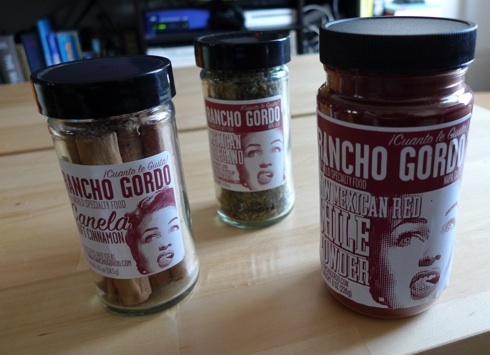 Oo amber, your recipe for borracho beans looks good – definitely going to have to put that on my to do list! Bread and Jam – hummus making is easy peasy! Just go for it!